Pergolas are fantastic investment to your home. A pergola, patio or verandah creates an all year round space for entertaining friends and spending quality time with the family anytime – rain, hail or shine. Would you think just any kind of patio roof is going to be perfect for your home? Pergola Land offers on-site consultations to ensure the best patio or pergola is designed, constructed and guaranteed for your home. We combine our experience and extensive knowledge with high attention to detail to create a modern design to compliment your home. A pergola is not just a cover, we’ll make it a part of your home. We design our pergolas & patios to be bright in Winter and cool in Summer. We use only the highest quality materials providing all year round weather protection. Our pergolas and patios are low maintenance so you’ll have lifestyle time. ArcoPlus®IR is a fantastic roofing solution exclusive to Pergola Land. The 8mm roofing sheets not only match the best of the other polycarbonate roof sheets on the market, but does better! It blocks more energy causing heat (Ultra-Violet and Infra-Red) yet lets more of the visible light spectrum through. ArcoPlus®IR technology means that they can create polycarbonate products with an infrared filter only on the external surface. This blocks heat from penetrating the space and can reduce the temperature of your pergola by up to 25%. It could well be the coolest place in your home. ArcoPlus®IR provides more light and less heat. You don’t need to settle for standard. No Sheet penetration/piercing, ensuring no leaks. Colorbond® Steel is a high tensile roof sheeting featuring a great look and large uncomplicated spans. The roof sheets are fully engineered to withstand the harshest weather conditions. These Colorbond® sheets are self supporting, meaning they can span over 4 meters without requiring additional support beams. Pergola Land’s custom designed and built pergolas create a great outdoor living area by combining the best we have to offer. The solid flat areas provide the most weather protection, using insulated roofing panels. The gable area is fitted with arcoPlus®IR roofing sheets that lets the light in. 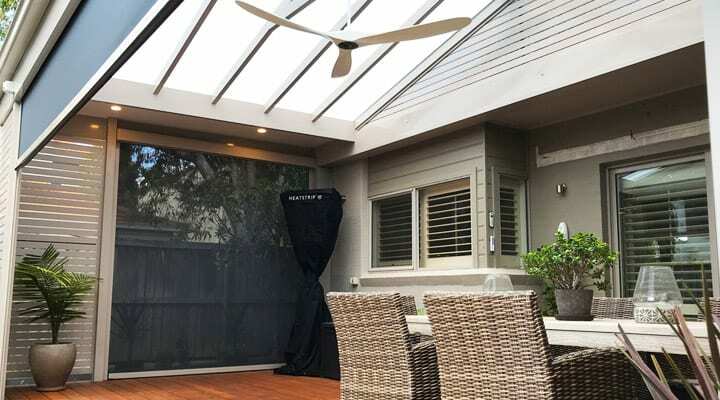 Finished off with lights, fan and heaters, the final result is the perfect outdoor entertaining area offering plenty of light and a lot less heat. At Pergola Land we offer a carefully designed and considered range of pergola and patio profiles to suit different environments and customer requirements. Talk to our experts today if you have any questions. Pergola Land’s flat/sloping patio covers are an economical and attractive way to cover any outdoor area. A Flat or Sloping roof profile is the simplest Patio Pergola form, fixed directly against the house without any gaps. It allows for large spans and a wide range of customisation. Gable roof Pergolas are very effective for improving air-flow. As the hot air rises, it escapes via the gable ends. This combined with the greater sense of space completely enhances the level of comfort. 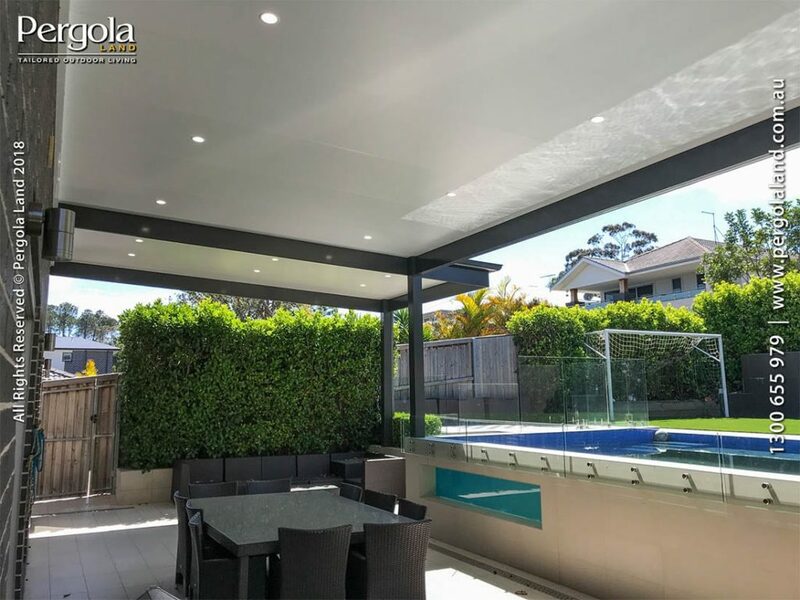 To finish off your Pergola Land custom designed and built gable pergola, fans and lighting can be installed for added comfort. A Pergola Land patio built on roof brackets is a popular choice, allowing added height and airflow. Also known as a flyover pergola, they give a luxurious and open air feel to a patio area and are the perfect addition to any home. A pergola built on roof brackets sits above the house gutter line, creating that grand outdoor entertaining area feeling. Summer time in Sydney can get very hot. Having your pergola sitting on roof brackets allows for the hot air to disperse more easily, allowing you to feel comfortable on those warm summer days. Each outdoor living area is unique – it doesn’t end at the pergola! 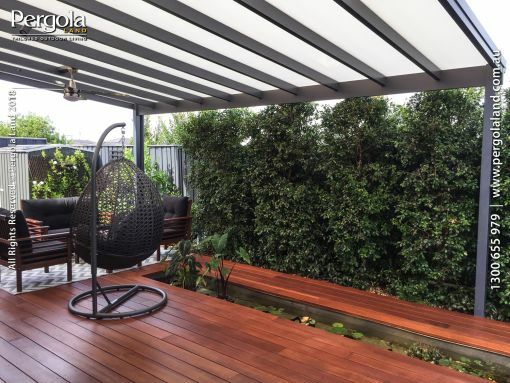 Pergola Land offer a range of quality optional additions such as handrails, blinds and privacy screens for that perfect finish. Talk to our experts today if you have any questions. Privacy screens are great for blocking out the neighbour’s view of your entertaining area so you can relax with your family in comfort. Privacy screens can also be used to hide unsightly utilities such as hot water systems. Custom built gates are a beautiful addition to any home. They can allow access under a deck for additional storage options and enhance safety for your family. We offer a range of handrails to suit your style and requirements, for safety or a simple way to divide an area. Outdoor blinds add extra protection to your home from the heat, wind, rain and insects. Our modern, innovative external blinds come in a wide range of finishes and designs. Our outdoor screens will allow you to enjoy outdoor living all year round. Your blinds will be custom made to suit your area. We finish off our blinds with aluminium trimming and a roller mechanism, allowing you to control the blinds to different heights. A deck is the perfect place for entertaining, somewhere to relax and to enjoy our great outdoors. Pergola Land can build a deck to any home’s landscape and also construct it with a colour scheme that can look natural and yet stand out as a great feature to your home. 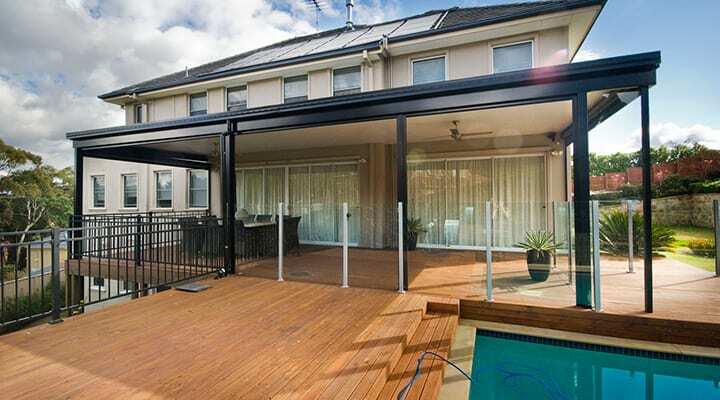 The great thing about a deck from Pergola Land is that you don’t need to look any further to complete your ultimate look. 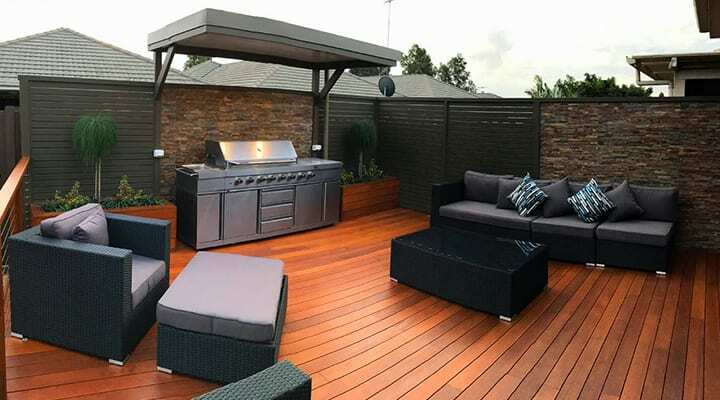 Not only can we give you a great looking Deck, but we can supply and install with all the extras you need to complement it.